Neilneville thanks for response, I nearly went for the black bay but like you suggest am going to give it some time to decide. That bronze version does look good and did not realise the case was bigger. Yeah I mean, how wearable is it everyday, y’know – when I’m not diving down to 200m which I do every weekend obvs. Is it the equivalent of buying an intense M1 to commute on because it looks great? Have you looked at the Seiko Turtles? I’m currently lusting after the “Save the Ocean” version. from what I can remember the limits are reference to the destruction test that they do on the watch case and 200m means anything to 20m is rock solid for water ingress, 1000m means solid to 100m. Unless an heirloom or a gift, it’s a piece of male jewellery, designed to project an image or reassure the owner. Nothing wrong with that, obviously, but at least be honest. Just a piece of jewellery, I agree. Men only really get to universally wear one piece of jewelry. Some dudes can rock wrist bands or necklackes but most of us, watches are all we got. Btw, if the bronze interests you, Bucherer have a limited edition with a blue bezel not brown, it’s got a waiting list though I think. This is my take. A wedding ring and a watch is all the jewelry I wear. So there is nothing at all wrong with wearing something a bit indulgent. £8000! I sold my Submariner about 5 years ago for £2000. Anybody got experience or views on Stowa or Laco? Flieger model A in particular. My Oris was £1800, I paid £800 for it new / old stock. I generally only wear the Oris. What image would I be projecting or what re-assurance do I need when I wear my cheapest watch on a day to day basis? Surely if I needed re-assuring I would wear my Rolex? Or if I wanted to project an image of myself as some sort of watch connoisseur then it would be the Panerai? I deliberately said there’s nothing wrong with it! We all indulge ourselves to a certain degree with our choices. As to what image you wish to project or how your watches make you feel, that’s a matter only you can answer. I agree about the car/bike thing, a Range Rover is jewellery, a Berlingo is a tool. I have a Doblo. I also have a nice Surly, which is a useful tool but also a beautiful thing to own. I’m also about to buy a Seiko Divers watch (SKX007J1), this will probably become my day to day watch. I like watches and love 007’s. the J1 happens to be my favourite too.  I’d absolutely love an Alpiniste, but they don’t make them anymore. I’ll probably not buy either and spend the money on a guitar instead. Choices, innit? I wasn’t decrying other’s choices, merely pointing out something that seems to get overlooked by those who value image above all else. Or if I wanted to project an image of myself as some sort of watch connoisseur then it would be the Panerai? Everyone knows the only watch that does that is the Seiko 5 on a NATO. Apparently 200m isn’t a lot when you factor in the momentary pressures associated with moving your hand in water. Try the turtle in for a while – cushion cases aren’t for everyone, I’m a bit torn on them. New or used? Rumours come every year that it is about to be discontinued but it seems it actually might be now. bloke jewellery, yes it is. I’m cool with a Seiko or a casio or a Patek Phillipe, whatever works for you. @w00dster 007 on a black nato. The rubber strap is horrible, you’ll end up swapping it out very quickly anyway. And personally, i don’t like that model of Prospex. No. A Breitling with emergency beacon, yes. A watch like the Seiko is a tool watch, it’s simple, pretty hard-wearing and tells the time. There are watches with a whole shitload of supplementary dials and whatnot that are hugely expensive, and are so complicated and difficult to read that their function as a watch has become secondary to their function as a way of showing off your immense wealth and lack of taste. I’ve been wearing my SPORK everyday for the last three weeks or so, having not worn it for months, and it’s like having an old friend back after a long absence, it’s so comfy to wear with the sharkskin mesh bracelet. It’s nice to have a number of watches to swap around on a whim, the only one I don’t wear on a regular basis is my Yema, only because it’s now quite a valuable watch, and almost irreplaceable, at least at a price I could actually afford, and it’s got real sentimental value as well. I might stop wearing the Seiko regularly, or at least to work, once the weather gets to shorts and tee temperatures, just because it’s more likely to get banged around and damaged, which I’d rather regret. As the result of someone mentioning Vostoks etc earlier on, this just arrived today. I’m staying out of here now before it gets any more expensive! I like that Vostok everyone. 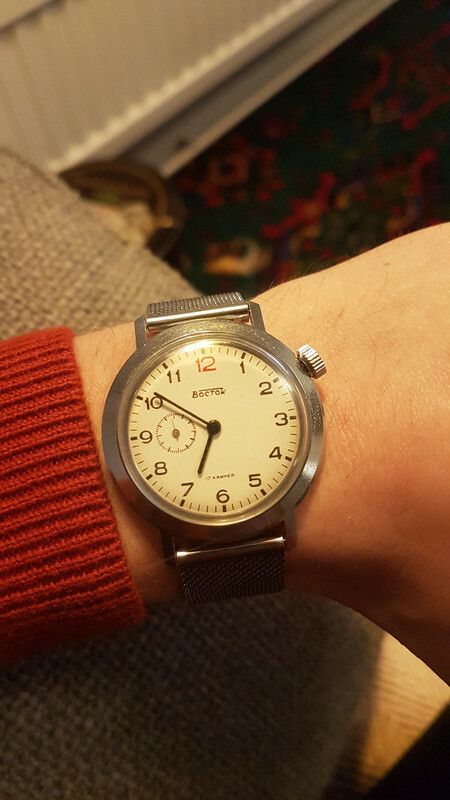 I am enjoying wearing my newly purchased Pobeda. I was surprised at the diminutive size of the dial compared to modern watches. Not being a deep sea diver or a pilot It does all I ask of a watch. I definitely think watches got too large. I wear a 42mm but it took a long long time for me to decide i could pull it off before buying it. had they made a 40 I’d have had it. Having recently got a 36mm, which these days is called a unisex size, it is sooooo comfortable! 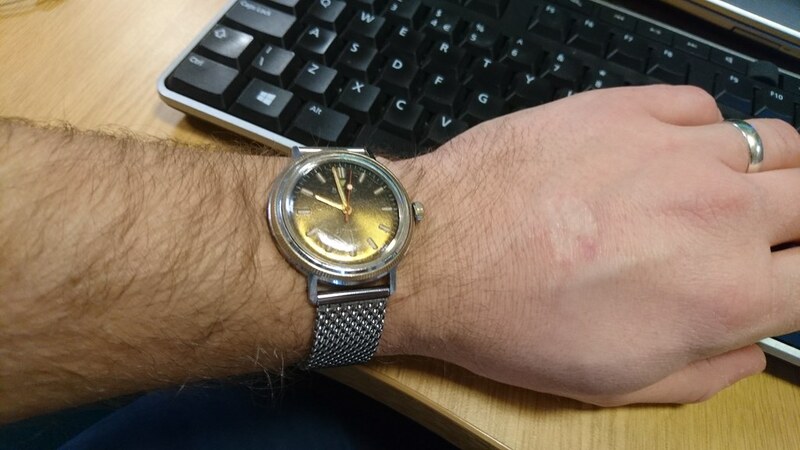 I may have slimish wrists, but for everyday use big watches can be a pain and look a bit silly. 34, 36, 38, 40 are all good sizes for men in my mind. 40mm as a dress watch on my 8″ wrists looks about the right size, not too small not too big. 42-44mm for everyday wear. I don’t like the oversize look. Sprocker if you are still looking how about a Schofield. A favourite brand of mine and British. They have a very cool bronze beater watch. If I knew how to post pictures of it I would! Link the 2 you mean, I’m not sure which. It maybe a movement tweak? That Smiths Everest from Timefactors looks good for £330. The black faced 210.30.42.20.01.001 Seamaster is the newer version with the Omega Master Chronometer Calibre 8800 movement, which is arguably one of the most advanced (mass-produced) movements on the market right now, competing with (and arguable beating) Rolex and the like. The blue dial version has the older version of this movement. Totally worth it to me, but you might not care about such things. I’d need to check the spec on the omega site but the 8800 in the black one is the latest version of the in-house movements designed ground up around the coaxial escapement that started with the 8500 in my PO. Awesome movement. Been around for about 8 years now. The blue one may have the previous movement, basically an ETA movement modified to put a coaxial escapement in. A solid movement, easier to deal with by repair guys, but not as good. right I’m back. just managed to post the brief words before while commuting home on the bus, then phone battery died. Anyway…dial is personal choice, you like it or not. the He escape valve got overhauled….you aren’t doing diving in bells and full He/O2 atmosphere? no? ignore that then…just make sure its screwed down and check occassionally. the old one shouldn’t …but did leak water if it got unscrewed…the newer one shouldn’t even more. Thanks for detailed responses I think will go for the latest movement in black, going to go and try one on along with a Tudor again and decide. (the indices were also printed not applied) and close together. The major indices 12 5,10 etc should be applied. Are you talking about the 1 second/minute markers?